Japan (MNN) — “When it rains, it pours.” In other words, when something bad happens, more trouble is right around the corner. Such is the case in Japan. Earlier this month, a typhoon brought record-breaking rainfall to southwest Japan. Last week, flooding caused by the rainfall triggered massive mudslides and left people stranded on rooftops. Now, says Takeshi Takazawa of Asian Access, a heat wave is complicating recovery efforts and the death toll keeps on climbing. More than 200 people have perished so far. Many of the deaths have occurred in three prefectures: Okayama, Hiroshima, and Ehime. People and organizations who are involved because of the disaster. “We come alongside local churches to reach out and help disaster victims,” Takazawa explains. A decade of natural disasters and partnership has sharpened the response of local believers to community needs. There’s a role for you to play, too. Please pray for the surviving family members of flood victims. Ask the Lord to comfort them in this time of grief. Pray for flood survivors in the disaster zone; more than 2,000 households have no access to clean water. Finally, pray for Asian Access and Japanese Christians as they put God’s love into action. Asian Access is also coming alongside churches and leaders in the disaster zone to help with developing strategy and providing physical, professional, emotional, and spiritual resources as God permits. If you’d like to give to the Japan Disaster Relief Fund, click here. “Give financially, or give time and energy by joining one of our reconstruction teams,” Takazawa suggests. Today, “we are still getting more numbers on people who lost their lives because of mudslides or the flooding,” comments Takazawa. Please pray for flood survivors as they reconnect with loved ones and seek temporary shelter. Pray for Asian Access and local believers as they share the Gospel in word and deed. Visit Asian Access’ website for the latest details about their response. Along with prayer, consider giving and going as the Spirit leads. You can help Japan now! 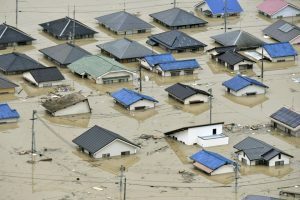 Thank you for considering giving to help flood victims in Japan.